by Courtney Ravelo Have you ever gone to see a movie with such high expectations that you just know you’re going to be somehow disappointed? But then the movie ends, and not only were you not disappointed, but your high expectations were exceeded? Like, by a lot? That’s what happened to me when I watched Captain America: Civil War. I’ve waited for this film for years, consuming every newly released trailer like they were medicine to my Marvel addiction (which they were). With a newly cast Spider-Man (Tom Holland) and Black Panther (Chadwick Boseman) being introduced, there is a lot on the line here. But thanks to directors Joe and Anthony Russo, the movie deserves six out of five stars. The film starts out in 1991, with a gritty scene of Bucky (The Winter Soldier) assassinating two people in a car and stealing a mysterious object they had in their trunk (the importance of which is revealed later). The story then moves to present day Nigeria, where Steve (Captain America), Natasha (Black Widow), Wanda (Scarlet Witch), and Sam (Falcon) are trying to stop Rumlow (the villain from Captain America: The Winter Soldier), but they end up accidentally blowing up a building, killing 11 people. This incident makes the United States government question the authority the Avengers are operating on — who is in control of them? Why are they allowed to get away with breaking the law? Just how many people see them as vigilantes instead of heroes? The U.S. Secretary of State proposes the Sokovia Accords; the Avengers must each sign them, agreeing that they will only act when the government calls them to and will cease action when told. Tony Stark (Iron Man), Rhodey (War Machine), Natasha, and Vision are all for it, but Sam and Steve completely disagree with it. Scarlet Witch, on the other hand, is undecided. This leads to a rift in the group. Steve and Sam team up to defend Bucky, who is under false accusations of blowing up a United Nations meeting in Vienna. Iron Man is tasked with bringing Captain America in for protecting a fugitive. 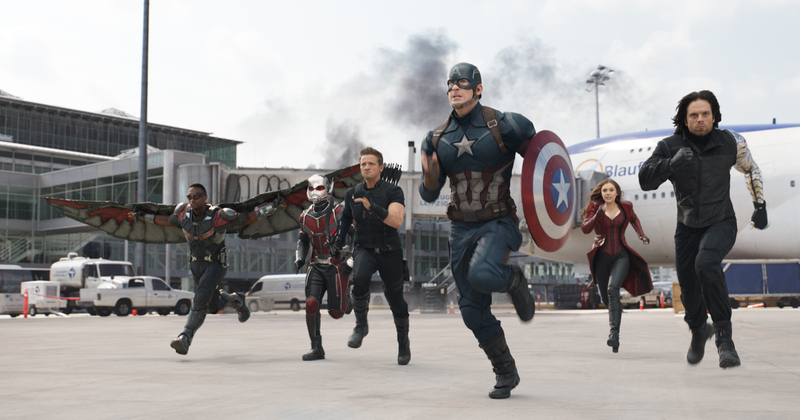 This leads to a face-off at an airport hangar where those on Captain America’s side are trying to take off for Siberia to stop Colonel Helmut Zemo (a vengeful Sokovian citizen) from activating other Winter Soldiers. Soon after, Tony finds out Steve’s motive (stopping the other Winter Soldiers from being activated), and goes to Siberia to help them. But a surprise for all three men awaits… a surprise that tears Tony and Steve apart and almost kills them. Cinematography-wise, this movie gets an A+. The diversity of shots never seems to miss a beat, constantly switching the angle to follow who’s most important in a scene, or to divert our attention to something happening in the background. 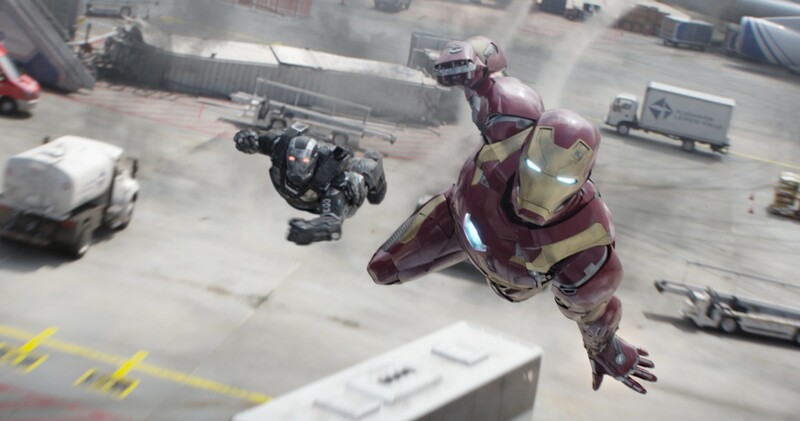 The camera zooms in and out of the fight scenes, perfectly capturing every detail of the Avengers’ fighting abilities. The sound design and visual effects are impressive. Civil War is edited down to perfection, with not a single hair out of place. The sounds of Tony’s suit and the destruction of the fight scenes are perfectly mixed together with the score playing underneath. The audio is almost overwhelming, but it’s realistically done. There aren’t any extraneous noises or bogus-sounding effects to throw the audience off. As for visual effects, my favorite moment is when Ant-Man becomes a giant. Instead of shrinking down like he usually does, he tricks his suit into making him ten times the size of everyone else. Everything looked so realistic, I couldn’t believe I was watching a fictional movie. Alternatively, the score isn’t all that memorable, but it does its job. It provides suspense when there needs to be suspense, climax when there needs to be climax. It didn’t “wow” me, but that’s okay. Just a small flaw in the otherwise too-perfect Captain America: Civil War. There is a lot of laughter in the film as well — ever present is Marvel’s classic brand of humor that keeps the story from getting too dark or serious. For instance, one of the biggest laughs of the movie comes during Stan Lee’s cameo. Playing a UPS employee delivering a package, Lee refers to Iron Man as “Tony Stank” instead of “Tony Stark,” and Rhodey proceeds to make fun of him for it. The newcomers to the Marvel Cinematic Universe are integrated well and make a noticeable impact on the action. Black Panther’s premiere is seamless, as his character is introduced via a United Nations meeting that Natasha is attending about controlling the Avengers. He’s driven by vengeance (sought for his father’s death) and this strong feeling is palpable throughout. Chadwick Boseman is perfectly cast, and so is Tom Holland as the newest version of Peter Parker. Holland portrays a playful, young and timid, yet carefree version, of Spider-Man that audiences haven’t seen from Tobey Maguire or Andrew Garfield. He’s recruited by Tony to help capture Steve and learns the true extent of his strengths and weaknesses as a kid just starting out with new powers. Marvel makes you want to believe in superheroes. It makes you want to believe that there are people out there serving the greater good, but it acknowledges that there will always be problems that arise within the group. There will always be critics, and there will always be five villains for every good guy. For me, one of the goals Marvel strives for is to help people understand that no one is perfect; that even these enhanced individuals have dark pasts and heavy hearts. Take Tony Stark, for instance. He lost his parents and still hasn’t forgiven himself for not telling his dad he loved him before he died. Natasha is another great example. She was raised and trained as an assassin until she changed her ways. Wanda lost her brother, Scott was in jail and lost custody of his daughter — the list goes on and on. But Civil War reminds us that there’s hope; that if these superheroes can fight through the devastating parts of their lives and work together, then they have the power to save the world — even if they have a major disagreement along the way.